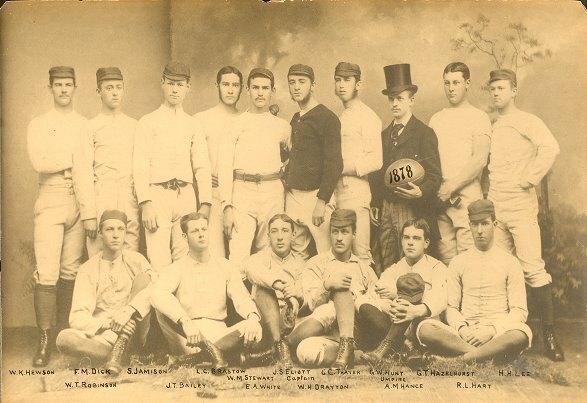 Penn began playing intercollegiate football in 1876. 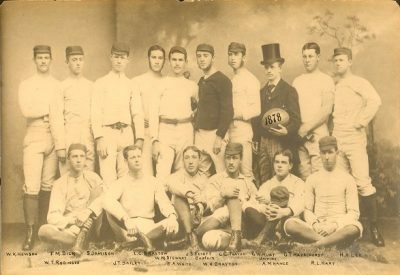 Before this Penn students had played football amongst themselves; but since the sport developed later than cricket, baseball and rowing, it did not have as consistent a campus presence as these other sports. The first football teams on campus were class teams, but these teams developed later than did the teams in cricket, baseball and rowing. 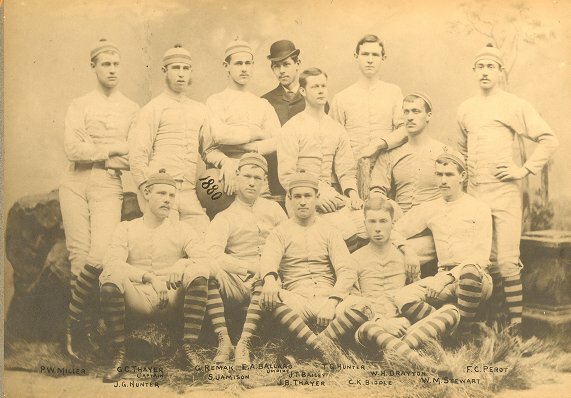 The first student publication to mention football at Penn was the 1872 yearbook. The brief description of football contests between Penn classes in the fall of 1871 includes the comment that football had existed at the College before then, but not for a while. The next mention of football, in the 1874 yearbook, describes football contests between classes at the 1873 fall athletic games sponsored by the new University Athletic Association. Then there is another gap before the inclusion in the 1876 yearbook of the members of the “Foot-ball Twenties” from the classes of 1877 and 1878. Penn’s first University team played Penn’s first intercollegiate game the following season, the fall of 1876. According to the University Magazine, Penn’s first student news publication, the Athletic Association was looking to pick “a twenty” to play a game of football against Columbia. This “twenty” never played Columbia, but did play twice against Princeton. The Pennsylvania team was overmatched each time by the heavier, more experienced, Princeton team, and lost both games by six goals to zero. After each game, the hosting team (Penn for the first game, and Princeton for the second) treated the other to supper, prompting one Penn player to remark that “if the result of being beaten is such delightful treatment, we would be willing to stand a great deal of it without complaint or murmur (Athletic Association History). In between these games, Penn’s “twenty” played the “All-Philadelphia” team. Penn won by four goals to the All-Philadelphia’s zero, making this the Red & Blue’s first football victory. These early games lasted half-again as long as modern games and were played under rules that emphasized kicking over tackling. Teams had twenty players to a side, nearly twice the modern eleven. No one wore helmets or protective padding, and a player who left the field could not return; consequently, substitutions were rare, and players often ignored injuries so they could remain on the field. This made football in 1876 a rougher, more injury-prone game than football today. A brief hiatus in competition occurred the following year. Because of scheduling conflicts with Princeton and Columbia and a lack of organization on the part of the team itself, Penn played no games against other colleges. Instead, students played class games only.